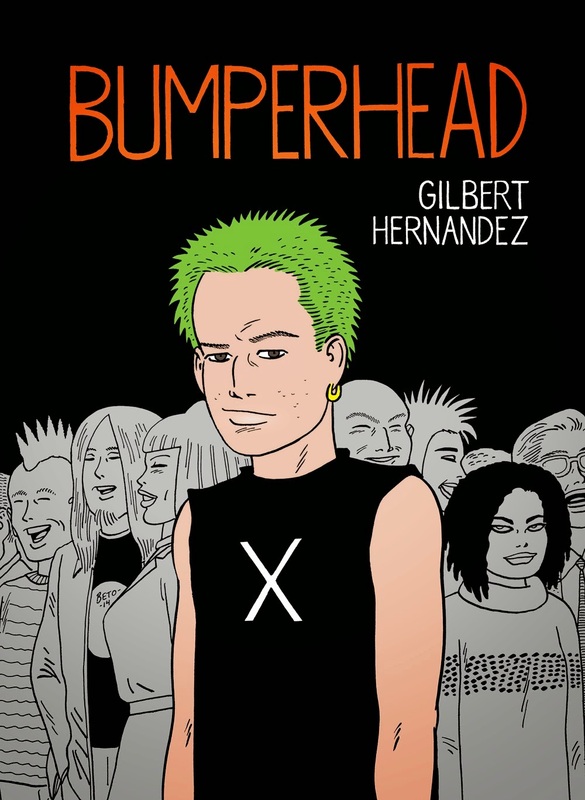 Bumperhead is the second original graphic novel that creator Gilbert “Beto” Hernandez has done for Drawn and Quaterly, following last year’s Marble Season. Marble Season was a semi-autobiographical story that dealt with the joys of childhood. In my review I described it as “love letter to the magical delights and misfortunes of childhood”. Beto used his own experiences as a framework for the story and with Bumperhead he set out to do the same thing with his experiences as an adolescent. The result is a fascinating story about a young man who was forever shaped by his adolescent years and the life lessons that can be taken from his past experiences. The book feels similar to a few recent works by Hernandez. Marble Season, of course, because it focuses on a period in a person’s life and develops that into a larger narrative. The other comic is the recent collection of Julio’s Day which tells of Julio’s entire life, from birth to death. Bumperhead combines these two narrative formats into a familiar yet different story of its own. The book starts with Bobby, a young man who is teased for having a big forehead, continues to spend a large portion of the book on his teenage and young adult years to finally wrap it up with a few pages of Bobby in his golden years to end with a strange and unconvincing declaration that he’s had a good life. Along the way, Hernandez deals with several issues. The first is the passivity of youth and how that can shape a sad, isolated and depressing adulthood. Bobby doesn’t seem interesting in committing to anything one thing in particular. He loves music, he loves girls, he likes hanging out with his friend and taking part in recreational drinking and drug use but he doesn’t have any ambition. He does all of these things but a particularly attractive girl or an excellent record are enough to make him change interests. When discussing his future with a girlfriend, Bobby mentions he doesn’t have any interests in going to college. He’s simply happy to be done with high school and he’s ready for whatever will happen next. What he doesn’t understand is that by choosing not to pursue any in particular nothing worthwhile will ever cross his path. It’s not surprise that he ends up working a job he hates and living alone. That is, until he discovers the punk movement and decides to get angry. He uses this anger to create a new lifestyle for himself but it’s hollow. It has no meaning for him. People get angry for all sorts of reasons and we often try to maintain the anger for extended periods of time. So long that we often forget what initially caused us to be angry. Bumperhead deals with this theme and we see Bobby deal with his anger in different ways throughout his life only to have it end with the recognition that it’s often not worth holding on to our anger as it’s a self-destructive emotion. Bumperhead also proves to be an interesting remuneration as to how the smallest things from our past (regrets, thoughts, actions, feelings) can and often do haunt us for the rest of our lives. It’s a neat look at the idea that high school never ends. No matter what we do to change ourselves, we remain the same. We struggle with our identity and the identity of others to the point of stressing ourselves out. The consequences are that it begins to affect our health. We care so much about what other people think of us that we change and continue trying to change to no avail. Bobby makes his way into the punk scene of the 1970s only to slowly move away from it all. He returns to the scene a few years later but he doesn’t recognize the movement anymore. 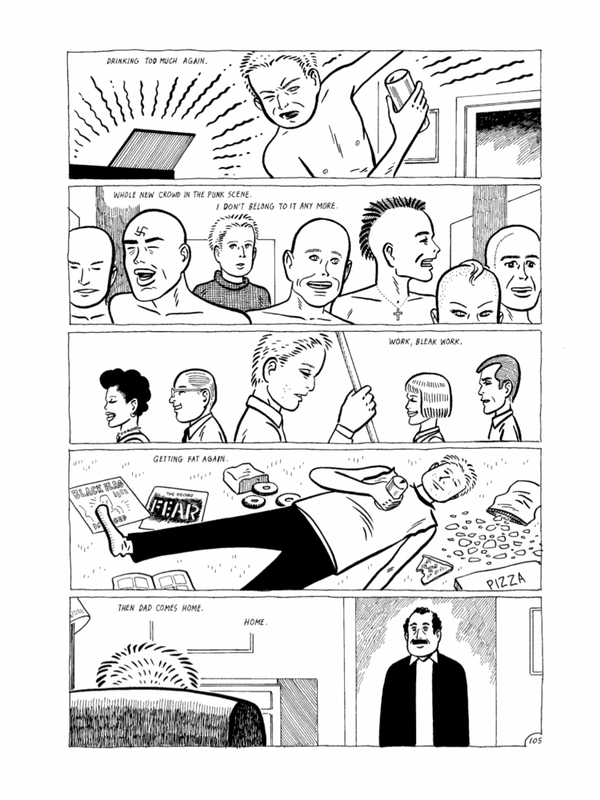 He sees other punks, shirtless with shaven heads and piercings. He admits to himself that he doesn’t belong anymore. Did he ever truly belong within the punk scene or was it just a way for him to run away from his past experiences? Just like he moved from one girlfriend to the next during his high school days, in adult life he moves from one scene to the other. At one time he’s a lazy, booze sloshing couch potato, then he becomes a heavy drugs user only to move in and out of the punk scene for a few years. Along the way he breaks old friendships, makes new ones as he meets new people only to sever ties with them, makeup with old friends, and start all over. At times Bumperhead feels like an anthology story. 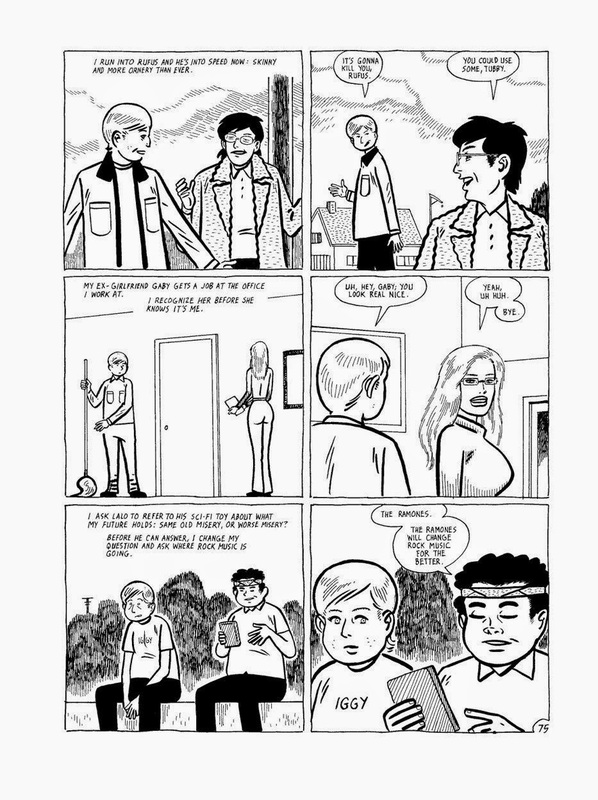 Beto uses the same characters is somewhat different roles in order to present the reader with alternatives to the lives of Bobby and the supporting cast. In each iteration the characters seem unhappy and it takes them their entire lives to recognize that they should stop pretending to be something they don’t truly want to be and simply be themselves with all their likes and dislikes. Even the characters who were consistent throughout the entire comic (and their life), such as Colette a born-again Christian who becomes a nun, doesn’t seem particularly happy with her life choices. It’s quite nice that Beto doesn’t appear to be judging any of his characters. Instead, he presents their lives with such ferocious veracity as to make his themes that much more effective. Similarly to his black and white illustrations his storytelling presents a stark dichotomy, heartfelt portrayals of humanity contrasting with some of the worst decisions individuals can make in a lifetime. This year Gilbert Hernandez won his very first Eisner Award for an untitled short story released in Love and Rockets: New Stories #6. He’s been nominated before but it’s shameful that the Eisner Award has failed to recognize such an important creator in comics. Gilbert Hernandez has worked with his brothers Jaime (and sometimes Mario) Hernandez on their ground-breaking and consistently spectacular comic Love and Rockets for more than thirty years. As if that accomplishment wasn’t enough, they’ve used Love and Rockets as well as their side projects to tell some of the most harrowing and heartfelt set of stories in any medium since the 1980s. They’re master storyteller, both of them, and it’s about damn time that Beto gets his Eisner. I wouldn’t consider New Stories #6 his best work but the man definitively needs to be recognized as being one of the great storytellers of our time. He’s worthy of your attention and readership and he’s got dozens of books in print, just waiting for you to dive in and shake you up a little. When people argue against comics being a trashy medium or being nothing but superhero stories, I suggest they read something by Los Bros Hernandez. 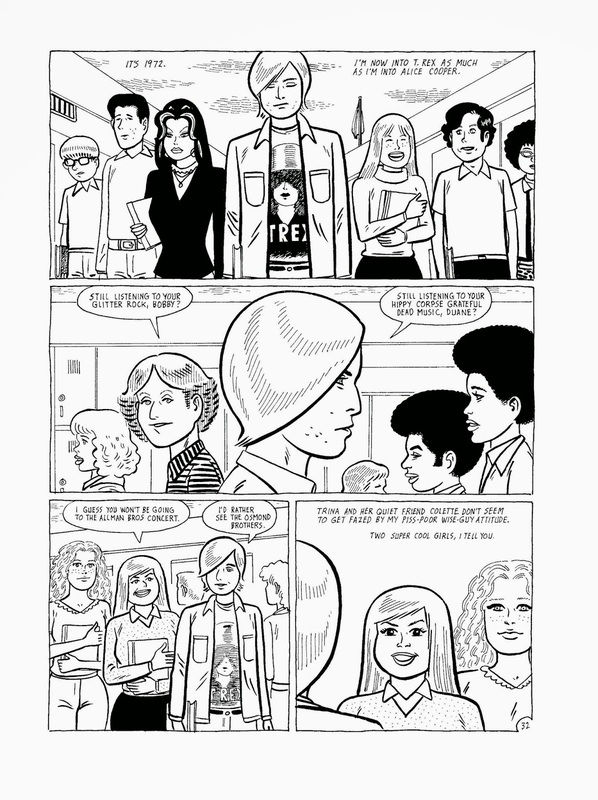 The works of Gilbert Hernandez act as definitive proof that comics can tell some of the most powerful stories in print.